The Sf-Bay Area Chapter held its first event of the year on 10 April 2017. Hosted by WeWork SoMa, around 30 people gathered to find out more about new Chapter Board Members, the Chapter’s focus and activities and to meet two of our new Working Group Chairs, Jackie Kerr (Working Group on Data Protection, Privacy & Security) and Brandie Nonnecke (Working Group on Internet Governance). There was lively discussion and several attendees expressed interest about becoming more involved in the WGs and in the Chapter in general. A full meeting report will be available shortly. Susannah Gray, President & Chair, welcoming attendees and getting the event started with an introduction to ISOC, the Chapter and Chapter activities | video. Leah Symekher, Advisor to the Board, discussing the Chapter’s ongoing Rural Broadband project in Yolo County, CA | video. Fatema Kothari, Vice Chair, outlining the Working Groups and introducing the WG Chairs, Brandie Nonnecke, Chair of the Internet Governance WG & Jaclyn Kerr, Chair of the Data Protection, Privacy, and Security WG outlining their vision and goals for the WGs | video. Audience introductions, and Q&A | video. 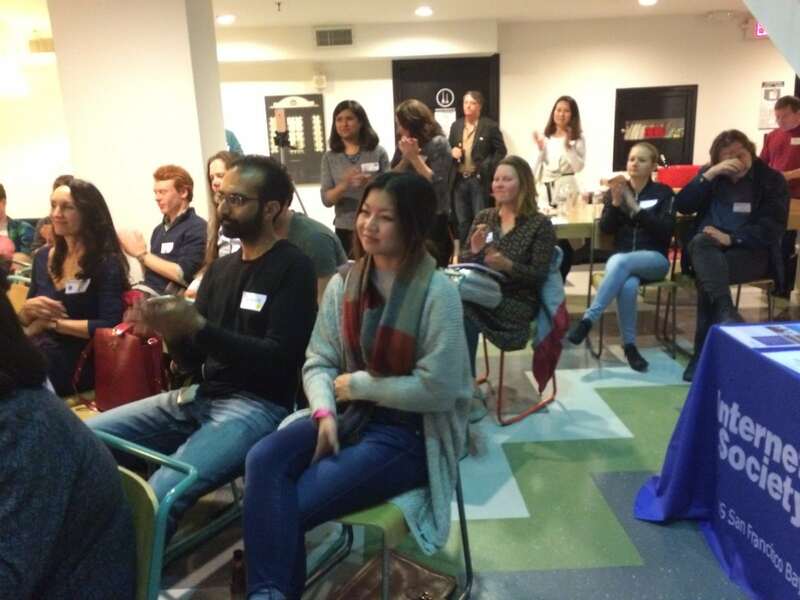 Special thanks to the SF-Bay Area Chapter Board, and volunteers Leah Symekher, Jenna Spagnolo and Kristen Quan for their support during the meeting, to Internet Society North American Bureau for sponsoring the catering, and to WeWork SoMa for hosting us.